Basically, increasing the thickness of film materials is one of the important measures to improve the barrier properties of packages. Meanwhile, the increase of materials thickness is bound to increase packaging costs. This article studied the influence of increasing the thickness of single layer membrane in composite materials on the barrier properties of packages, through test the oxygen permeation of film materials with different thickness. Barrier performance is one of the basic properties of packaging materials to protect the content products. The barrier properties of packaging materials are related to materials structure, thickness, and etc. For the same film materials, when the thickness is increased， the barrier properties are improved. The composite materials are most used for plastic packaging. By combining different types of single-layer films, the composite materials can make full use of the advantage of different materials to meet the packaging requirements. Since they play different roles in packaging structure, the influence of increasing thickness of different layers is also different on improving the packaging permeability. Therefore, blindly increasing the thickness of the packaging material may not achieve the expected barrier properties, but seriously increase the costs. In this paper, we tested the oxygen permeability of films materials with different thickness, and then analysis the influence of increasing the thickness of different layers on the barrier properties of packages. We used PET(12μm)/PE(45μm)、PET(12μm)/PE(60μm)、PET(25μm)/PE(45μm) with different thickness as specimens for this study, and tested their oxygen transmission rate. We used differential pressure method to test according to ASTM D1434 – Standard Test Method for Determining Gas Permeability Characteristics of Plastic Film and Sheeting. 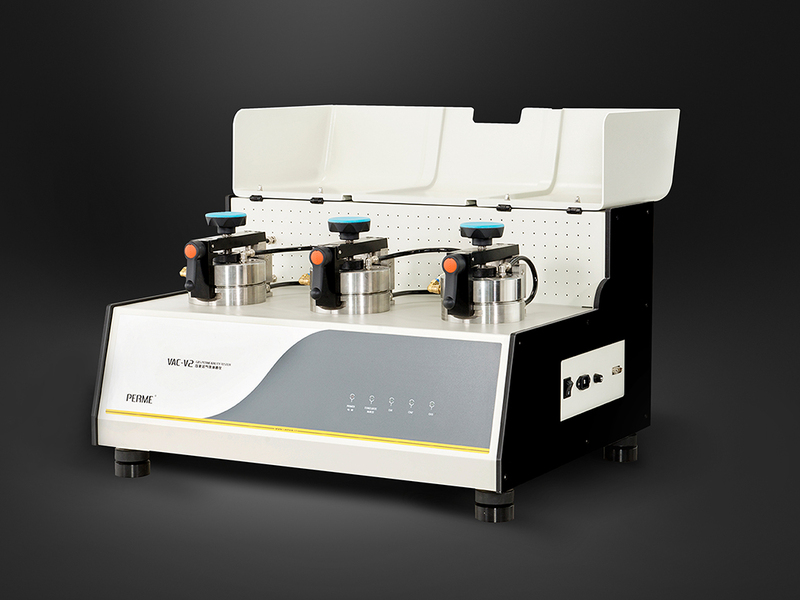 The equipment used is VAC-V2 Gas Permeability Tester, provided by Labthink Instruments Co., Ltd. In principle, the oxygen transmission rate is the quantity of oxygen passing through a unit of plastic film in unit time under stated temperature and gas pressure on both sides of the films. The equipment we use has three test cells, which can test these three specimens at the same time. Apply a light coating of vacuum grease on the flat metal that the surface of the specimen will contact. Avoid excessive grease. Locate the upper plate then carefully position this plate over the specimen and fix the plate with uniform pressure to ensure a vacuum-tight seal. Set up the specimen name, specimen thickness, temperature, humidity and other parameters in the software, turn on the vacuum pump and click the Start Test option to start the test. The equipment is tested according to the set parameters and the test results are displayed after the end of the test. Compared with Specimen #1, the oxygen transmission rate of specimen #2 & 3 both decreased because of the thickness increase of PET or PE. The OTR of specimen #2 reduced by 18.891 cm3/(m2?24h?0.1MPa) with a 15μm increase in the thickness of PE layer, while the OTR of specimen #3 reduced by 60.680 cm3/(m2?24h?0.1MPa) with a 13μm increase in the thickness of PET layer. This indicates that PET layer bears the main oxygen barrier effect in the test materials, increasing the thickness of PET layer is more conductive to improve the oxygen permeability performance of the materials. The Equipment used in this test has three test cells and we can obtain the test results of these three specimens in one test. The test efficiency was very high. Labthink Instruments Co., Ltd is dedicated to providing integrated professional quality control solutions for packaging manufacturers, food and beverage producers, medical and pharmaceutical companies, and daily chemical and printing industries. Our Greater Boston headquarters combines functions of the North America sales division, the R&D center, the packaging testing laboratory, and the customer services center and administrations.